No matter what stage you’re at in your meeting or events professional career, Thursday, April 4th, 2019 should be blocked out on your calendar as the day you tune in on one of the most important days in the meetings industry. Global Meetings Industry Day (GMID) is a day of celebration – industry leaders from over 40 countries spanning 6 continents come together in one global message that “meetings matter!” Whether your business focuses on meetings, conventions, conferences, exhibitions, trade shows or special events, this is the day to learn how meetings are impacting the world. For GMID, follow the branded hashtag #GMID19 and #WorthMeetingAbout to follow events and activities hosted around the world – watch, listen and join the conversation to gain insight that can boost your business and network. You may also tune into a live all-day live online broadcast of education focused on GMID that’s being hosted by the Meeting Professionals International (MPI) association – CLICK HERE for more information and to register for this free online stream. And so many more take-aways that you will benefit from! According to a survey conducted by Meetings Mean Business Coalition on 150 business leaders, 92% of the respondents said they plan on investing as much if not more capital into face-to-face meetings, conferences, and other events as they did the previous year. It also reflects the time-tested sentiment that meetings are considered an utmost priority and an investment that achieves a greater return than even technology or customer research. AMA Executive Conference Centers is proud to be a part of the meetings industry…because when meetings come to town, everybody benefits! 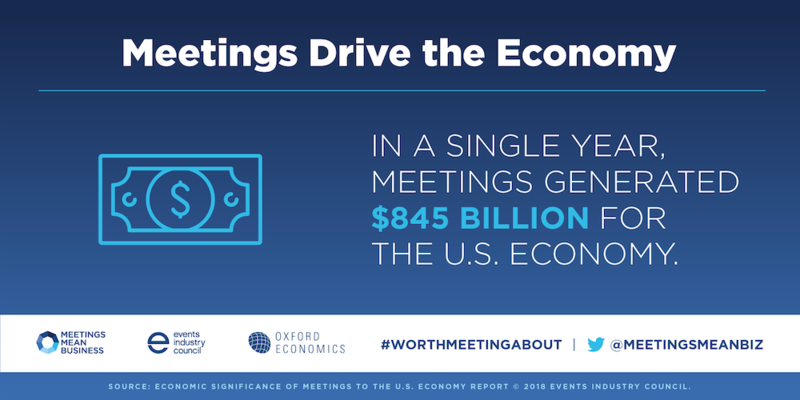 Are you contributing to this $2.65 trillion in global economic impact by planning meetings for your company or client in 2019? Click here to contact us and discover how AMA Executive Conference Centers can help you deliver a masterful and engaging presentation at one of our venues in Atlanta, New York City, San Francisco, and Washington D.C.